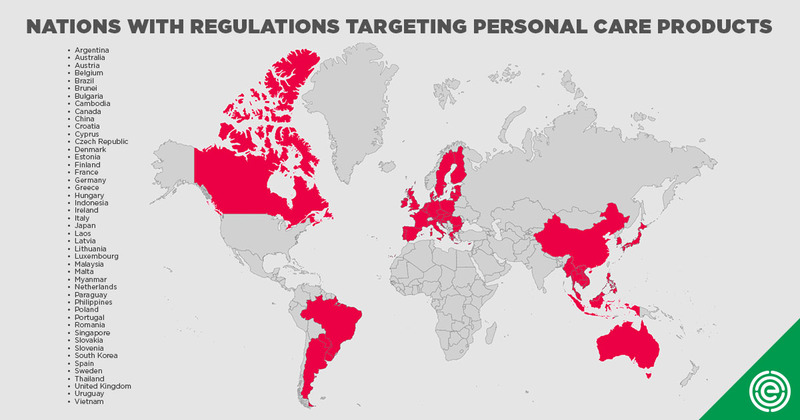 More than 40 nations – ranging from major industrialized economies like the United Kingdom and Germany to developing states like Cambodia and Vietnam – have enacted regulations specifically targeting the safety and ingredients of cosmetics and personal care products. Some of these nations have restricted or completely banned more than 1,400 chemicals from cosmetic products. By contrast, the U.S. Food and Drug Administration has banned or restricted only nine chemicals for safety reasons. More Than 40 Nations Have Stricter Cosmetic Safety Regulations Than the U.S.
Formaldehyde. Regulators in some nations subject formaldehyde, a known carcinogen, and chemicals that release formaldehyde, to tight restrictions. But similar restrictions are not placed on formaldehyde and formaldehyde releasers used in cosmetics and other personal care products sold in the U.S.
Parabens. Parabens are regulated in Japan, the EU and the Southeast Asian nations, where officials have set maximum concentration standards. In the EU and Southeast Asian nations, some parabens that EWG found in U.S. products (isobutyl and isopropyl parabens) are not permitted in any cosmetic product. PFOA. Beginning in July 2020, the use of PFOA – one of the thousands of fluorinated compounds known as PFAS – will be restricted in cosmetics and other personal care products sold in the EU. But there are no such restrictions on this carcinogen in the U.S. EWG found 13 PFAS compounds in nearly 200 cosmetics and other personal care products. Triclosan. The FDA has banned the use of triclosan, which disrupts the hormone system, in antiseptic wash products like liquid hand soaps, but not in other consumer products. By contrast, more than 40 other nations restrict the amount of triclosan in consumer products. Toluene. This chemical, linked to reproductive and neurological harm, is restricted in nail products in Europe and Southeast Asian nations, but can be used at any level in cosmetics sold in the U.S. Many of these toxic chemicals and contaminants are also being phased out of the store-brand products offered by U.S. retailers even though they are still legal in this country. CVS Health, Target, Rite Aid and Walgreens have publicly committed to restricting or banning many of these chemicals from their own cosmetic brands in coming years. Federal cosmetics law was put in place in 1938, and has not kept up with the changes to the industry, even though some retailers and other countries have. There are efforts in the current Congress to modernize the lax regulation and keep pace with the international community. Sens. Dianne Feinstein (D-Calif.) and Susan Collins (R-Maine) have introduced legislation to give the FDA more power to review and, if needed, regulate or even ban chemicals of concern. But states are not waiting for Congress to act. Two California state legislators have introduced legislation to ban 20 of the worst chemicals and contaminants in cosmetics. A Connecticut state senator has introduced legislation to subject U.S. cosmetics to the same standards as those adopted by the EU. See details on these chemicals, their uses and their health effects here.